The in-game server browser has limited filtering options, so I made a new one! The source code is on Github and very easy to run on any PHP+MySQL system. Any bugs can be reported in this topic, or directly on Github if you have an account. Let me know what you think. Is it ugly? Not useful? Amazing? Needs another feature? Let me know! Last edited by luc on Mon Sep 26, 2016 12:30 am, edited 2 times in total. This is very useful! Especially if I search for players. In other news, version 1.0 was just released. Since the announcement sorting was added, linking servers was fixed, and some back-end things got better. It's complete and reliable enough, so this is 1.0! I still have some ideas to add (the ones on Github and more), but right now the community response seems a bit timid. Perhaps a better server browser is not as necessary as I thought, or people didn't see it, I don't know. In any case, I'm going to pause adding features unless more people respond (here/reddit/irc/whatever) or more people start using it. What about a cookie with search params? Oops, forgot to respond after uploading the feature. If you previously visited the site, there is now a button to load the previous settings. You can try it by searching for something, closing the tab, and opening it again (Ctrl+Shift+T reopens a closed tab). I made it a button because I thought it would be confusing to automatically apply previous settings, as they may have been very specific and might show no servers at all, or randomly filter the one out that you might be looking for. Let me know if this is not a good solution for some reason. Hey devs, hope you've seen this. The devs are aware of this: I asked for permission to run it. What do you want them to do with it, integrate these options in the game? luc wrote: The devs are aware of this: I asked for permission to run it. Excellent! 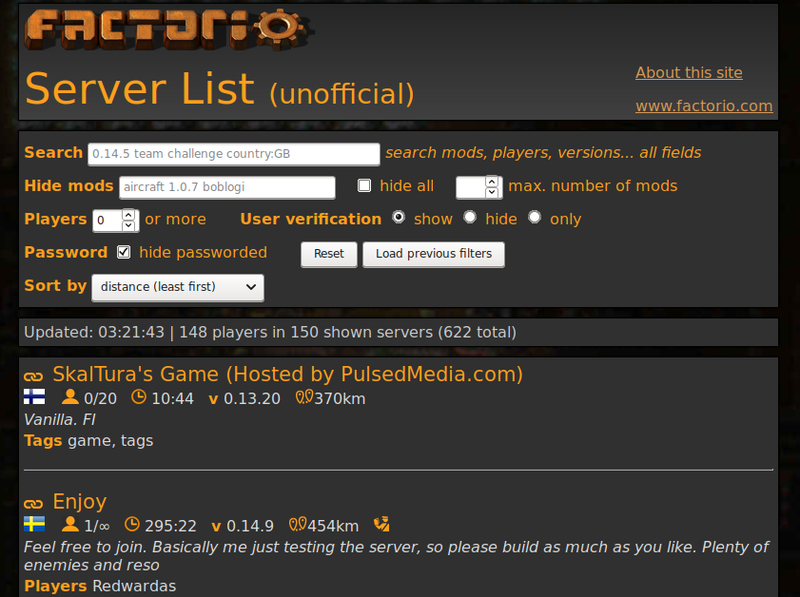 Not merely suggesting a new server browser but implementing it as well! Thinking about the suggestions... maybe I have an even better idea: sort by distance. It would obtain your location from your IP address and compute how far each server is away. How does that sound? Sounds interesting and certainly worth a try if you think it is a better approach. Also maybe sort by ping if that´s possible? I wanted to do that, but unfortunately this is only possible from a client, not from a website. Factorio does not communicate over HTTP, or even TCP (the underlaying layer of HTTP) so there is no way to communicate with Factorio game servers from your browser. And of course the measurement must be done from your computer, locally, not from my server, or it would be no use at all for people in a different country than my server. The game could totally do this though, ping all servers and sort by that, and I know games that do, but Factorio doesn't have that feature (yet?). I could also write a program that supplies the ping from your computer to my serverlist, but I wasn't sure whether people would trust that program or care enough to run it, even if it is open source, so I haven't made it (yet?). I would certainly use an executable version of your server browser if one was available. It would be a nice option. It wouldn't be a complete replacement, only something that runs in the background to provide the website (upon loading the page) with ping times to all servers. Even if I would make a full client, which would be a lot of double work, I'm not sure it could launch Factorio and connect to a server directly. The game seems to need some code to connect (this code is visible in the API data, called "game_secret") and Factorio doesn't have a command option to provide that code when connecting directly to a server. - Sort by distance from you! - Loading time improved hugely. For me it went from 2.8 seconds to 150ms (network traffic time not included, though that's improved too). - You can now find mods by just, y'know, clicking on them! Test the new features now (click here) and let me know if you run into any trouble. Or if you have more ideas! Oh it seems like the sort by distance is indeed better idea than the sort by country, but I see you implemented both, which is nice! I had my doubts about how it might work for some reason but yes, sort by distance actually finds Finnish, Russian, Swedish and Norwegian servers for me first (me living in Finland). So it is probably the best way for me to find a low latency server.